VNU Exhibitions Asia Pacific Co., Ltd. (VNUEAP) organized exclusive interview session with invited experts from Science & Technology and Food industries presented by Dr. Udom Chanasit (President of Science and Technology Trade Association), along with Ms. Orawan Kaewprakaisangkul (Executive Vice President of National Food Institute) and Mr. Anucha Parnpichate (Project Manager, VNU Exhibitions Asia Pacific). They previously joined for the forum at BITEC, Thailand, on 1 June 2017. Important information on laboratory instrument trading market was released. It is anticipated to expand for more than 15 % which becomes the driving force of R& D Investment. Moreover, Research and Development will be an important mechanism for the Thailand 4.0 policy to move forward. With respect to the food industry in the region for the past three years, the growth rate for ASEAN food market has been marked at 12.8%. With the tendency for food business market to embrace the impact of the digital era, , these growth rates inspired organizers of Thailand LAB INTERNATIONAL 2017 exhibition to believe that it is time for scientific & laboratory investment to soar high. More than 12,000 international visitors from around the world are expected to be at BITEC in Bangkok on 6-8 September 2017. 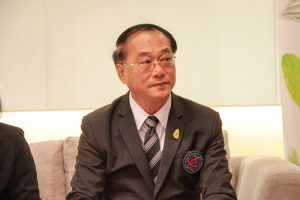 Dr. Udom Chanasit, President of Science and Technology Trade Association (STTA), disclosed that the investment market on scientific laboratory instruments has increased at the rate of 15% from previous rate of 10%. This is based on the total market value of 60,000 million Thai Baht. This is due to government policies that stimulated and promoted investments within the private sector. 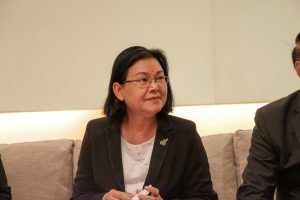 This transpired through interesting projects, such as the Super Cluster Project, which elevated the national economy through 10 major industries in Thailand. Moreover, the Thailand 4.0 policy will be focusing on building viable industries through the Pracharath (Social Enterprise) model and investment on Research and Development (R&D) expenditure. The R&D process will be realized in partnership with universities, private enterprises, and business operators. This is to help innovate Thailand to become a “Value-based Economy.”, which is necessary to optimize modern technology and laboratory instrument. Currently, the ratio for R&D investment in both private and government sector has increased at 0.75%of the GDP or at almost 1 trillion Baht at the moment. This is seen as a good direction for both government and private sector. Through this, they may be able cooperate drive the Thai economy at the international level. Furthermore, it is important mission for the Science and Technology Trade Association to stimulate investments on scientific and laboratory instruments in the industrial sectors, educational agencies, research, and medical sciences in both government and private sectors. These will be providing support for Thailand to become one of the most modern laboratory centers in the ASEAN region. Ms. Orawan Kaewprakaisangkul, Executive Vice President of National Food Institute from Ministry of Industry, shared that the food industry sector has a tendency for the continuous growth. This can be derived from the rise of new generation, which is gradually attaining more purchasing power together with the ingredient development, consumption behavior, synthetic nutrients, and new consumption trends that greatly strengthens value for the food industry. In 2016. The growth of the ASEAN food market reached 14.2%, and Thailand’s food export market impact in the CLMV group, which consisted of Cambodia, Laos, Myanmar, and Vietnam, has achieved 55% ratio of the ASEAN market with an export value of 148,642 Million Thai Baht. It has also seen an expansion of 20.0% last year. Vietnam has the highest rate of Thai imports at 34.7%, followed by Myanmar (28.5%), Cambodia (21.8%), and Laos (15.0%). Furthermore, Ms. Orawan shared a guideline for the food business development. She suggested that it is really necessary to improve technology for manufacturing process, quality control, cost reduction, strengthening benefits through synthetic nutrients, and to achieve international standards. Technology can also lead to more and faster sales channels. Moreover, it can help meet customer demands through online systems. Currently, the food delivery service market has reached a fast growth rate of 11 – 15% from the last year. Another trend on the market is the consumption of healthy foods, which become very popular among professionals and health conscious individuals. 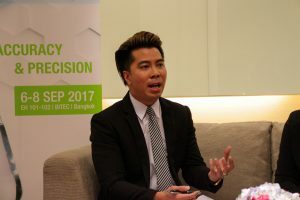 Mr. Anucha Parnpichate, Project Manager of Thailand LAB INTERNATIONAL 2017, revealed that that the laboratory instrument industry along with the biotechnology market are what drives the Thai economy forward. It has reached a growth rate of up to 15% and can potentially increase in the future. He said that “it is a strength that makes us confident and dedicated to make Thailand a regional exhibition hub for scientific & laboratory market place. For the past seven years, Thailand LAB INTERNATIONAL served as host to largest and most complete laboratory instrument technology and innovation exhibition in the ASEAN region. In 2017, visitors will meet with 330 leading companies from 30 countries around the world. They will be able to visit international pavilions from China, India, Germany, South Korea, Taiwan, and UK etc. Local and international buyers, researchers, laboratory manager and technician s, and experts are expected to participate in this exhibition. Moreover, business matching will be strongly implemented to promote the investment to Thailand and the region Furthermore, we will invite potential buyers, researchers, laboratory professionals from all the world to meet leading laboratory instrument manufacturers and distributors via our hosted buyer program d. Interested buyers can register themselves www.thailandlab.com until 30 June 2017. Pre-register online is also now open at www.thailandlab.com. Thailand LAB INTERNATIONAL 2017 will be on 6-8 September 2017 at EH 101-102, BITEC, Bangkok, Thailand.